BrickJournal Subscription (6 issues Economy US) [Starts with NEXT issue] : TwoMorrows Publishing, The Future of Comics and LEGO™ Publications. 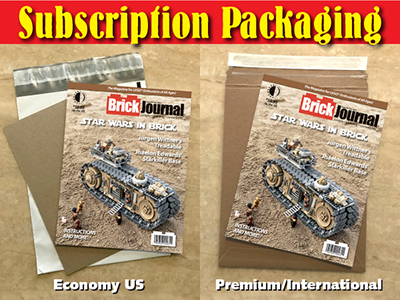 BRICKJOURNAL magazine is the ultimate resource for LEGO enthusiasts of all ages. Edited by Joe Meno, it spotlights all aspects of the LEGO Community, showcasing LEGO events, people, and models every issue, with building tips and how-to articles by top builders worldwide, new product intros, LEGO Mindstorms robotics, step-by-step instructions and techniques for all skill levels, how to customize LEGO Minifigures, and more!